2 way center channel (3 drivers), 120W. Two x 165mm (6.5") drivers with diecast chassis, ICPâ„¢ injection-moulded co-polymer polypropylene cone, Apicalâ„¢ former, and one 25mm (1") PTDâ„¢ pure-titanium dome and former, ferro-fluid damped/cooled tweeter. Detailed accuracy, superb build quality. None whatsoever at this price point nothing can touch it. Vocal reproduction, Ability to cross it over lower than most. This center is incredible; it produces vocals both male and female with perfection. This center also shines with a good movie, you can really lean on it hard and it will take anything you throw at it. Highly Recommended! this is a v3 version. excellent sound quality for the price, as is all the paradigm speakers. I have system matched with paradigm studio 40v3 mains, audioquest cable, paradigm pw2100 sub, sony es strda3000es receiver...this system rocks any small to midsize room and highly recommend it to any audio/video enthusiast...the sound quality doesn't exactly match that of the studio 40's but is close enough. Beautiful sound and match the monitor series very well. I have been using the CC-370 v.3 for about a month now. After first buying the CC-170 to accompany my Paradigm Mini Monitors as fronts, I was completely disappointed. At mid to high listening levels, the sound was quite harsh. I returned them for the 370. With the 370, I never have this problem. Highs were always really balanced and natural sounding. Voices with bass sounded remarkable. Female voices are really smooth and airy. The 370's match, sonically, the Mini Monitors very well. very well matched to essemble,wide dispersion and naturally sounding. I have owned the monitor,s 11v2,s,mini monitors(surrounds),and cc370(center).The 370 is very good on axis,with good dispersion. (hint)With my reciever in THX mode voices had proper weight. 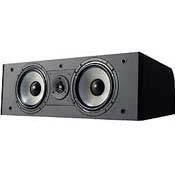 I researched speakers before an afterI purchase my emsemble an for the money there is no better speaker period. Infinity Kappa,s II,B&W,s 605,s,Boston accoustic center. Can be a bit thin at times, but only a bit and it depends on the source. One thing I have discovered in trying to build a great sounding home theatre system is it can be very difficult to find great sounding equipment. I have been researching and testing gear for over a year now and I'm only now beginning to completely replace my old system. During my research on the web and in stores I kept coming across fabulous reviews on the Canadian made Paradigm speaker systems so I found a store in my area went down and had a listen and wow wee those reviews were right. I have fallen in love with Paradigm speakers. I have been shopping for speakers in the thousands of dollars range and I gave this center channel a listen and I must say I was impressed. I shopped around some more and returned to the store to buy the Paradigm center channel. This is Not a perfect sounding speaker, it can be a little bit thin at times but it is a very good sounding center chanel and when you look at the price this is a great speaker for the value. I am a very fussy person and I am satisfied with the performance of this unit and would absolutely recommend it to any one who wants a great sounding center chanel at a very reasonable price. For the most part it has a nice full rich natural sound with great dispersion through out the room. The center chanel is a very important speaker when you are driving it with a high end amp like the one I'm using and I am very pleased with my purchase to say the least. I also picked up a Paradigm sub woofer (PS 1000) and it's great for home theatre and a great value as well. It's really wonderful to find a good product at a good price that you can recommend to others. To the guys who thought it sounded boomy, it definately must have been a lemon, as i could not be happier with mine. im running monitor 7 v3's up front, mini monitors v3's for rears, this as a center (also v3) and it's all being driven by a marantz sr4200 (its only for a bedroom). i could not be more pleased with this setup, i went to many high end stores and demoed entry and mid-range lines of many different speakr companies, and paradigm easily showed itself to be equal to speakers that cost many times more. back to this center channel, it mathes the monitor series perfectly (as it should), and i foudn it to be bright an airy without ever being harsh. i purchased the rears and center after the mains (i had been running cheap speakers before and was in the process of upgrading) so i ran the whole system in 5 channel stereo for a few days to break everything in, and it made a noticable difference. however, eevn right out of the box this speaker sounds amazing. all thats left is a PDR 12, and the system will be complete. highly reccomended. - Crystal Clear - Perfect timbre match to other Monitor series speakers by paradigm. - Brass instruments sound phenominal on this thing! If you dont have a Large RPTV it might be a daunting task putting it on your TV. The thing is a beast in size and weighs a few pounds too. Dont get me wrong this is fantastic but for a guy with a 32 tube tv he may want to buy a mini stand and place it lower and angled up for best results! How do you explain perfection? I've had over 5 Centres in 6 years!!! I believe I finally have the one I've been looking for. The centre channel regardless of what some idiots will tell you is the most important piece of hardware for your Home Theatre. The Paradigm CC-370 is without doubt the most sonically superior piece of equipment on the market in this price range or for that matter a few hundred bucks more range too. As above: poor definition, bassy, muddied. Upgraded to this center with the Monitor 7.2 fronts, atoms for surrounds, and SVS subwoofer. Driving the speakers with a Sony 30ES receiver. While the Monitors sound very nice as fronts, the CC370 center is boomy and the dialogue very muddied. The center sounds like it is in a box or under water. After reading the other posts, it seems I may have gotten a lemon. . .
PSB Alpha center, Energy Take 1 center.